DOYLESTOWN (PA) – The Delaware Valley University football team continues its quest for a Middle Atlantic Conference (MAC) title on Saturday, October 31 when it hosts Lebanon Valley College on Military Service Day. Kickoff at Robert A. Lipinski Field at James Work Memorial Stadium is slated for 1:00 p.m. The Aggies, ranked 24th in this week’s D3football.com top 25 poll, are coming off a 28-23 victory over previously unbeaten Albright College. The win propelled DelVal into a tie for first place in the conference at 5-1. However, the Aggies own the tiebreaker with head-to-head victories against both Albright and Stevenson. Therefore, DelVal controls its own destiny and will capture the MAC championship and an automatic berth to the NCAA Division III Championship Tournament if it wins its final three contests. Two of its final three opponents are just a game out of first in Lebanon Valley and Widener (November 14). Last week’s triumph over Albright brought the Aggies’ overall record to 6-1. DelVal did so by limiting the Lions to just 99 yards on the ground and winning the turnover battle, forcing two interceptions without giving up the ball themselves. The Lions did not do themselves any favors, missing two field goal attempts plus an extra point. The Aggies are ranked first in the MAC and eighth in all of Division III in rushing with 296.7 yards per game. 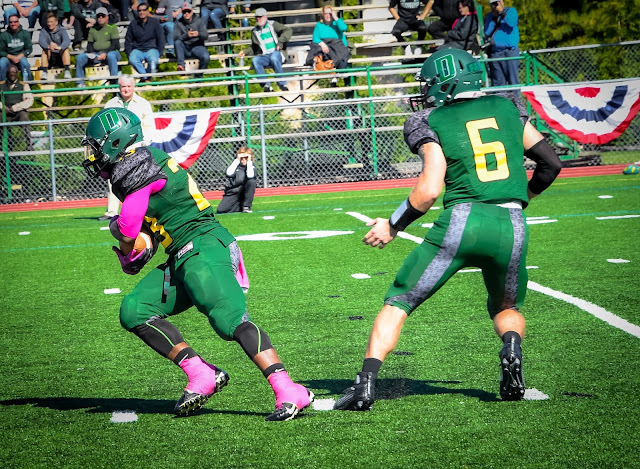 DelVal is also second in the conference in total offense (419.3 ypg). Sophomores Devauntay Ellis (Ewing, NJ/Ewing) and Armani Fuller-Williams (Philadelphia, PA/Mastery Charter) and junior Robert Cleveland (Willingboro, NJ/Willingboro) lead the Aggies’ rushing attack. Ellis, a junior college transfer, leads the team with 536 yards and five touchdowns on 60 attempts (8.9 avg). He ran seven times for 29 yards in the victory at Albright. Ellis has surpassed the century mark twice this season. Fuller-Williams picked up 45 yards on just eight carries, including a five-yard score, against the Lions. That increased his season totals to 377 yards on 58 chances (6.5 avg) and six trips to the end zone. His season high is 120 yards at Misericordia on just 11 rushes with a 57-yard touchdown. Cleveland has run the ball 70 times for 405 yards and two scores. He was held to 31 yards on eight opportunities in last week’s game. Cleveland’s best effort this year is a 162-yard performance (16 carries) with two touchdowns at FDU-Florham. Freshman quarterback Dashawn Darden (Norristown, PA/Cardinal O’Hara) and junior wideout Tyler Bing (Galloway, NJ/Absegami) have also been difference makers on the ground. Darden has netted 348 yards on 48 attempts (7.3 avg) with two scores. He rushed 17 times for 38 yards at Albright. Bing racked up 83 yards on just three attempts against the Lions, including a 70-yard sprint to pay dirt. The effort upped his season totals to 29 carries for 306 yards and five touchdowns. Bing has also caught 16 passes for 179 yards. Darden was the starter under center for the first timer in last week’s game. He threw the ball 20 times, completing 10 for 92 yards and two scores. Both touchdown tosses went to Michael Jensen (Woodbridge, NJ/Bishop George Ahr), including a 26-yarder with 9:11 to go in the fourth quarter for the winning points. On the defensive side of the ball, DelVal has been one of the nation’s best. The Aggies are tops in the MAC and 23rd in the nation in rushing, allowing just 99.6 yards per game. They are also second in the conference in scoring defense (14.0) and fourth in total yardage (320.6 ypg). DelVal’s 14 points allowed per game is also good for 20th in Division III. Senior safety Danny Wynne (Hatfield, PA/North Penn) leads the team in tackles with 52. The two-time all-MAC honoree made 10 stops last week, including an assist on a fourth-and-one play from the Aggie one as Albright was trying to go up by two scores in the third quarter. Sophomore Shawn Miller (Laurel, DE/Laurel) has totaled 46 tackles, two interceptions and one forced fumble on the season. 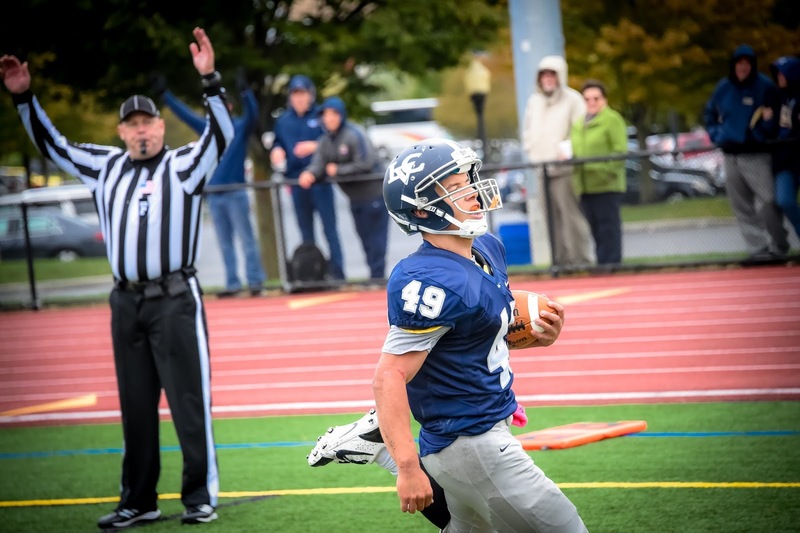 The safety made five stops and recorded an interception in the end zone for a touchback in the Albright game. Miller was the MAC Defensive Player of the Week after his performance versus Stevenson, where he produced eight tackles, one forced fumble and an interception that he returned the pick 100 yards for a touchdown. Senior linebackers Ethan Snyder (Catawissa, PA/Southern Columbia) and Rashaad Lighty (Pottstown, PA/Pottstown) have registered 43 and 35 tackles respectively and the two combined for nine stops against Albright. Eight of Lighty’s stops have been for a loss, including five sacks. The 2014 all-MAC and all-region selection also has five forced fumbles, which is tied for first in all of Division III. Lighty was chosen the MAC Defensive Player of the Week earlier this year after the King’s game, where he had six tackles, 2.5 sacks and two forced fumbles. The Flying Dutchmen ride a three-game win streak into Doylestown. They improved their overall record to 4-3 with a 48-17 victory at Wilkes University last week. Lebanon Valley pulled away in the second half, scoring the final 28 points of the contest. The Flying Dutchmen are still in contention for the MAC crown and NCAA berth with a 4-2 league mark, but need to win their final three games and receive some help around the conference. Lebanon Valley is putting up 35.7 points per game, good for second in the MAC. The team also ranks second in rushing (258.6 ypg) and third in total yardage (408.4 ypg). Sophomore Tim Pirrone has taken over the reins at quarterback. Pirrone is 45-of-83 for 668 yards and nine touchdowns in seven games. He completed 15 passes in 24 attempts for 160 yards and three touchdowns against Wilkes. Pirrone added 10 rushes for 33 yards and a score. He has four touchdowns on the ground. Junior Brendon Irving is the team’s workhorse and the leading rusher in the conference as he has 155 carries for 925 yards and five touchdowns. He has eclipsed 100 yards in every game this season, including a 109-yard effort with one score (26 attempts) last week. Junior Travis Saylor is the top wideout with 20 receptions for 325 yards and two trips to the end zone. Sophomores Jeremy De La Cruz and Kyle Zimnik have caught 18 (255 yards) and 12 (125 yards) passes respectively. Both have two touchdowns to their credit along with Irving. Lebanon Valley is allowing 23.1 points per contest, fifth in the MAC. Fifth-year linebacker Trevor St. Clair leads the unit with 47 tackles, 6.5 for a loss, 3.5 sacks, three interceptions, one fumble recovery and one forced fumble. The team captain made five stops against Wilkes. Senior captain Kevin Antol made six tackles last week to up his season total to 34. The safety has four tackles for a loss, one sack, one interception, one fumble recovery, two forced fumbles and one blocked kick. Linebackers Tim Gallagher and Tommy Garner have amassed 33 and 31 tackles respectively. Garner also has a fumble recovery and forced fumble to his credit. The two sophomores tied for the team lead with seven stops apiece against Wilkes. Senior cornerback Ricky Feggins and sophomore safety Blake Lutz are two other players to look out for. Feggins has intercepted three passes this year, which is tied for the team lead. Lutz returned a pick 46 yards for a touchdown last week.